Avast- A very famous Anti Virus program or software developed by Avast Software. Avast is one of the most popular antivirus who not only protects your data but also protects your privacy too. I'm also using Avast antivirus protection and i really like it. Avast has nearly 230 Million users worldwide who are using AVAST Products. This highly demanded software came in various modules. 1. Antivirus and Anti Malware Protection. 6. Smart Scan (Best Feature). 10. Automatic Patching of security holes. 4. Done! 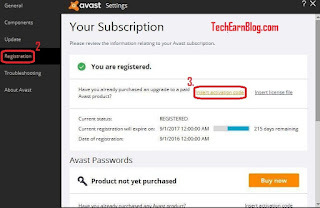 you instantly get free premium key of avast antivirus on your email. 5. Now Download Avast Antivirus free version from avast official website. 6. After That Open Avast Antivirus & Enter Ther Avast Serial Key Which are Your already Received In MailBox. If You Don’t Know Hows to redeem then Apply Avast Serial Key the Follow The step Which are Given Below. 1. Open Avast Antivirus . 2. Click on Setting Tab. 3. Click to Registration Tab. 5. Click on “Insert the licence key "Button". 6. Then Fill The Avast Licence Key of 1 year free. Congrats now Your Avast Antivirus can Be use for 12 month for free. I hope you got this article properly. If you face any kind of problem, just comment below. If you need any kind of special giveaway just contact us and stay tuned. Thanks for staying with TechEarnBlog.